This website, accfcorpgov.org, is brought to you by ACCF to shed a light on the performance of America’s public pensions, the increased politicization of these funds for political gains, and the impact these efforts are having on the pocketbooks of taxpayers and beneficiaries. Despite the broader bull-market for equities over the last eight years, many of the nation’s largest public pension systems are struggling to meet the funding requirements their beneficiaries rely upon for secure financial futures. The reason for these are multifold: fewer current workers, more retired pensioners, and larger payout obligations due to government action. 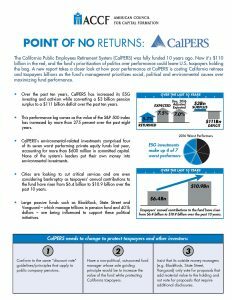 Making matters even worse, new evidence finds a growing tendency on the part of those who lead many large public pension funds to use beneficiaries’ money as a vehicle to champion certain political causes and issues at the expense of doing what’s necessary to improve fund performance. The result: political gains for pension leaders and increasing financial burdens on taxpayers and retirees. It’s time for struggling pension funds to change protect taxpayers and investors. Through ACCF’s research and reports, we will advocate for pensions to focus on increasing the value of the fund, protecting taxpayers, and pushing its outside money managers to support proposals that add material value to companies.